Here you see a module that will make up a quarter of the completed home. There are three other modules that will need to be transported, each on their own truck. Your house has been built in the factory and your land has been prepared to receive the house, so now it’s time to bring the completed modules to the site. This stage can be extremely stressful because your home is speeding toward you at 65mph on the backs of trucks that you have no control over. Don’t worry; the main reason that your home was constructed in such a solid way was that so it can survive the trek over the road in one piece. 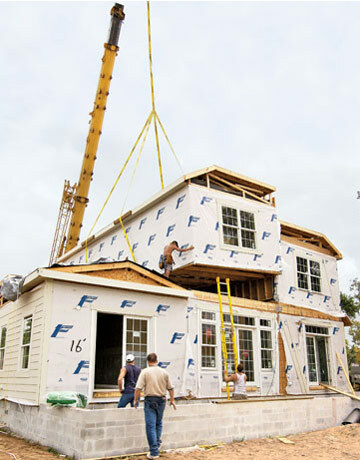 Once the modules make it to your property, they’ll need to be unloaded from the trucks with a crane. They’ll be set next to the build site and then lifted on to the foundation one at a time after they’ve all been unloaded. 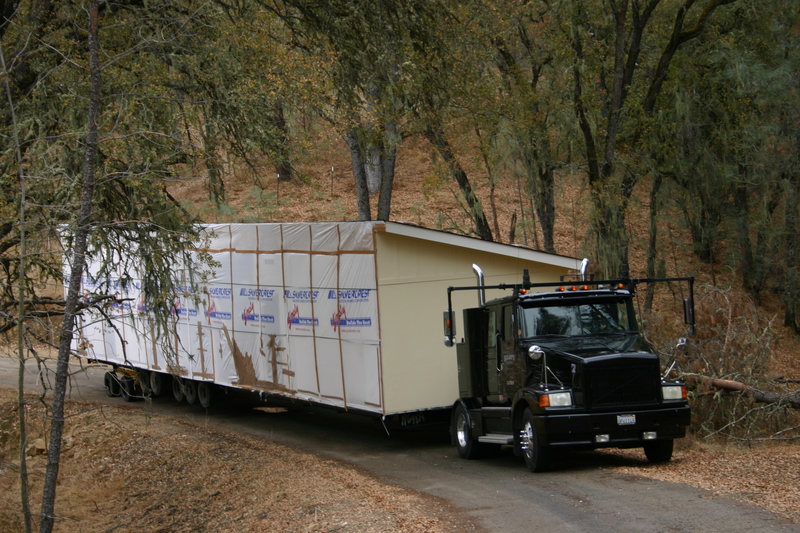 If your home is only one module, it can be lifted straight from the truck on to the foundation. Image Source: Country Living. The last module is placed. A small or medium sized house like this one will usually take only one day to set. For small or medium sized houses, it can take less than a day to place your entire house on the foundation, but for larger houses, you will need to make sure that all modules are properly covered and weather-sealed in case the weather turns over-night.